[Limited for 2015, Full time for 2016] I love Graeter's ice cream but unfortunately I have very little access to their products right now. I mention this because I had no idea that of the limited edition flavors they offer every year, they pick one to become a full time flavor the year after. Well, Graeter's was nice enough to send over samples of last year's big hit. Could definitely smell the cheese when I peeled off the lid. I see the fondant flakes! I scoop a small serving and there are square pastry pieces everywhere. There's no blast of cinnamon coming off of them, they are more comlimentary and low key flavor wise. Present but not bold. They've got plenty of crunch to them. 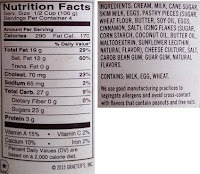 The flakes actually have a bit of crunch too and add to the sweetness. This one has got a nice strong cheese flavor that lingers. Consistent and strong in every bite really. There's plenty of sweetness as well. Sweet cheesiness! This one has some high nutritional facts so it's good that it's packed with flavor. If I feel guilty, I can just take smaller bites. Some ice creams you inhale, others you savor. Grab a small spoon and savor every bite. No need to rush here (the fact it's a nice dense ice cream helps slow you down as well). Obviously you need to be amused by cheese to enjoy this one, but if you are, then this is one sweet ride. I haven't said much but I guess I'm too busy enjoying the quality and rich flavor. You know I love sweet flavors and this totally qualifies. 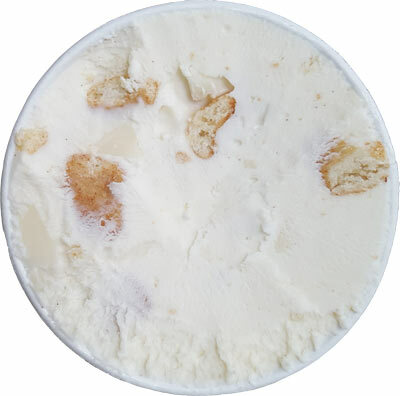 On Second Scoop: If you've ever had New Orleans Ice Cream's Creole Cream Cheese flavor, than you know the kind of flavor and excellence that's going on here. The difference here being that we've got mix-ins now and I definitely enjoy their presence. I'm sorry if I'm being brief but it's one of those flavors where I don't know what to say other than it's really good. 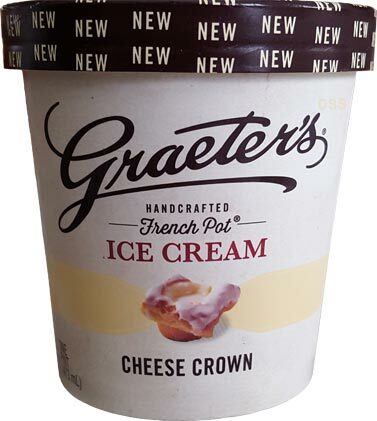 So, if you have access to it, go grab this sweet cream cheese flavor that rocks Graeter's well known quality and texture. I highly recommend ordering from their online shop, to have access to all of their pint flavors (including this seasonal one) - totally worth every penny. I didn't realize that they sell it in MA but I checked the website and apparently they do. This flavor doesn't interest me...cheese and ice cream is not a good combo in theory to...but many of the others do! But I am so into my B and J fudge brownie ice cream and the brownie batter core that I am content. @Liz: no money in the food budget for that unfortunately! 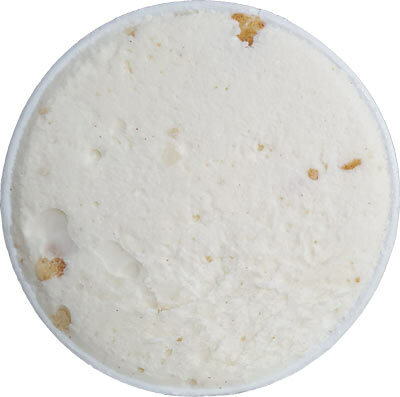 It's really good to see that Cheesecake ice creams have not vanished completely. Yet, I wish generic ice cream companies produced cheesecake ice creams at a low cost because the price of these good ice creams can be really expensive. ^^^ Its likt 5-7$ for Graeters. You get what you pay for. There is a reason their ice cream is top notch. When you buy a half gallon of generic ice cream for 3$ its going to be what you pay for. Not many companies offer the mix-ins and ice cream quality Graeter's brings to the table. If you order offline their shipping is pretty affordable for online orders compared to other vendors. This flavor is really one of their best. Next to Buckeye, CnC, and Black Raspberry Chocolate Chip it was very well done. I asked Graeter's, and this flavor is only going to be available in the mid-west and the East Coast. It's available online, but I don't have that kind of money to spend on ice cream. I have got to try this! Only one store in my area carries Graeter's and it never seems to go on sale for some reason. Hopefully soon. I saw a segment on the company on an old episode of Unwrapped recently and couldn't believe that they still hand pack each container. I got this on clearance and it's so good! I'm glad I was able to try it. Best ice cream ever. I tried it for the first time last week and had to go back to the store for more. My new favorite.